This represents '#pragma omp threadprivate ...' directive. Definition at line 39 of file DeclOpenMP.h. Definition at line 70 of file DeclOpenMP.h. Definition at line 72 of file DeclOpenMP.h. Definition at line 69 of file DeclOpenMP.h. Definition at line 71 of file DeclOpenMP.h. Definition at line 88 of file DeclOpenMP.h. Definition at line 89 of file DeclOpenMP.h. Referenced by classof(), clang::OMPDeclareReductionDecl::classof(), clang::OMPDeclareMapperDecl::classof(), clang::OMPCapturedExprDecl::classof(), clang::OMPRequiresDecl::classof(), and clang::OMPAllocateDecl::classof(). Definition at line 28 of file DeclOpenMP.cpp. Definition at line 40 of file DeclOpenMP.cpp. Definition at line 83 of file DeclOpenMP.h. Referenced by varlists(), and clang::OMPAllocateDecl::varlists(). Definition at line 85 of file DeclOpenMP.h. Definition at line 75 of file DeclOpenMP.h. Definition at line 84 of file DeclOpenMP.h. Definition at line 86 of file DeclOpenMP.h. Definition at line 74 of file DeclOpenMP.h. Referenced by clang::ASTDeclWriter::VisitOMPThreadPrivateDecl(), and clang::ASTDeclReader::VisitOMPThreadPrivateDecl(). Definition at line 77 of file DeclOpenMP.h. 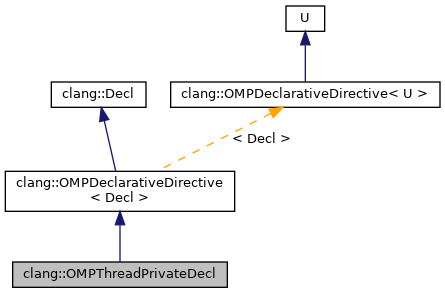 Referenced by clang::CodeGen::CodeGenModule::EmitOMPThreadPrivateDecl(), clang::ASTDeclWriter::VisitOMPThreadPrivateDecl(), and clang::ASTNodeTraverser< Derived, NodeDelegateType >::VisitOMPThreadPrivateDecl(). Definition at line 80 of file DeclOpenMP.h. Definition at line 42 of file DeclOpenMP.h.